When the first leaf turns orange and the first pumpkin appears on roadside stands or at the market, I am ecstatic. That means that pumpkin spice everything will soon be on the market. I love Pumpkin Spice Lattes, PS Cheesecakes, PS doughnuts, PS milkshakes…..well, you get the message. I just find great delight in the combination of flavors. We stalk the doughnut shops until the sign goes up and wow. It’s hard to not eat all of the delicious delicacies that are in the box on the way home! So I have a question……why is pumpkin spice only offered for two months? No sooner than you get settled in to the offerings of the season, they are gone…giving way to eggnog or peppermint. Gone in a flash and leaving me heartbroken, longing for more. Now unless I am missing something, the Pumpkin Spice whatevers appear at the same time as pumpkins, leaving me to conclude that they are made with canned pumpkin. So, if that is the case why can’t we have these year round? I see canned pumpkin on the shelves all the time along with cinnamon and cloves. Can’t we have Pumpkin Spice Lattes all the time? Doughnuts? Maybe just a little cheesecake now and then? So what does this mean? Between now and the end of fall I have to eat a full year’s supply of doughnuts, cheesecake, and drink all the milkshakes and lattes I can hold. Is that really smart? No. So, the medical profession should rise up and require Pumpkin Spice to be offered year round. Now I knew we could come to a great conclusion if we just put our thoughts together. 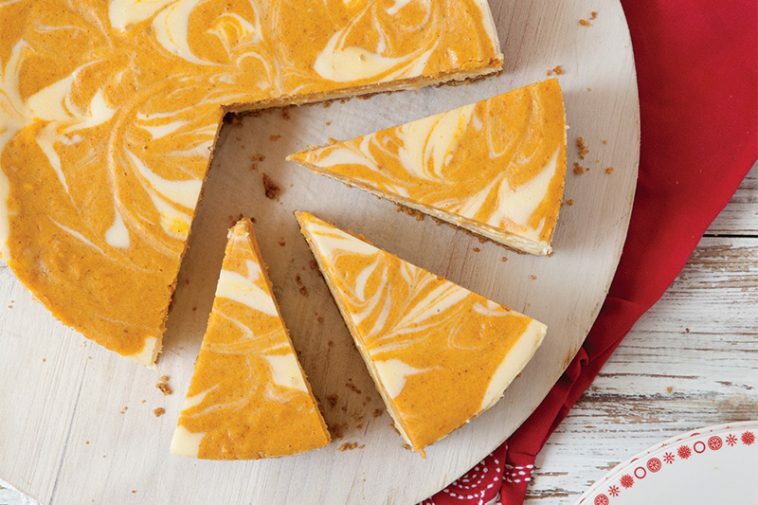 Meanwhile, I have a great White Chocolate Pumpkin Swirl Cheesecake recipe, from Taste of the South‘s Best of Holiday Baking issue, for us all to bake. Celebrate fall and when you are drinking your Pumpkin Spice Latte….think of me and my quest! Preheat oven to 300°. Spray a 10-inch springform pan with baking spray with flour. Line bottom of pan with parchment paper; spray again. Wrap bottom of pan with foil. In a medium bowl, combine graham cracker crumbs, pecans, toffee bits, and butter. Press into the bottom of prepared pan. In a large bowl, beat cream cheese and sugar with a mixer at medium-high speed until smooth and creamy, about 5 minutes. Add eggs, one a time, beating well after each addition. Add sour cream, white chocolate, and vanilla, mixing to combine. Reserve 11⁄2 cups batter. Pour remaining batter into prepared pan. Set aside. In a medium bowl, combine 1 cup reserved batter, pumpkin, ginger, coriander, cardamom, and pumpkin pie spice. Pour over batter in pan. Drop remaining 1⁄2 cup batter by tablespoonfuls over pumpkin batter. Using a knife, create a swirl pattern in batter. Set springform pan in a large roasting pan; place roasting pan in oven. Carefully add water to roasting pan to come halfway up sides of springform pan. Bake for 11⁄2 hours. Turn oven off. Leave cheesecake in oven with door closed for 2 hours.Remove from oven; refrigerate for 24 hours. Gently run a knife around the edge of pan to loosen sides, if necessary. Remove sides and bottom of springform pan. Cover, and refrigerate up to 5 days. 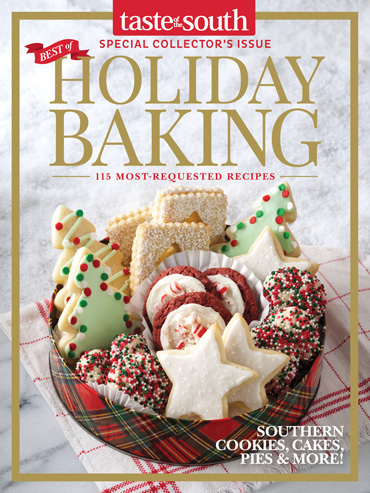 Best of Holiday Baking Baking 2016! Pumpkins! I love them so much that my kitchen decor is pumpkins and ivy! That way, I get to enjoy pumpkins all year long! Thank you for your take on pumpkins and spice and all things nice about fall. Your magazines continue to inspire me with beautiful table settings , recipes, and your outlook on making the things of everyday life beautiful! You are truly appreciated!! So so so true!!! Thank you for sharing this amazing recipe! While I look forward to pumpkin spice treats this time of year, I think if they were available year round they would not be as appealing. (My husband disagrees, he loves a good pumpkin pie whenever he can get it!) I like the variety each season brings and some in the medical profession say it’s smart to eat seasonally as it ensures your body gets what it needs at that time. But I do love your humorous take on it all. Happy Pumpkin Spice Season! Very Amusing, I feel the same way. Here’s to year round pumpkin everything! I buy the spice at the grocery store so I can enjoy in homemade goodies year-round. They just do this in the fall in Celebration of your Birthday! Come to my house, I’m making Toll House Pumpkin Spice cookies with white chocolate chips, just for you! You are a joy in every season! Yes, it’s time for Pumpkin bread with maple-cream glaze and a cup of java. so I try to do some fall pumpkin flavors and make it a special occasion each time. I just love pumpkins, period. Just decorated some for my front porch. I am looking forward to pumpkin pie @ Thanksgiving & I just might try this cheesecake recipe. Sounds yummy! I love your sense of humor❤️ My reaction to the areas that can’t find canned pumpkin is to cook your pumpkins and freeze it. That’s what I do and have PS everything the entire year. Phyllis , consider yourself lucky. We live on the beautiful Pacific Northwest Pennisul in Sequim Wa. Most of the time canned pumpkin is only on our shelves in the fall. It has only just appeared. And your are right,lattes, breads, muffins, cookies, and anything pumpkin will begone,even canned pumpkin! So let’s enjoy while we can. Thanks so much Tracy and Shelli for an interesting interview. One question: How important is it to have multiple networking sites? I understand the need for a web page and a blog, but, considering the time it takes to keep things up and running while still writing new material, does one need FaceBook, MySpace, Twitter and multiple blogs? If you had to choose, which would you consider most valuable for a writer? Thanks again. I, too, love pumpkin flavored things , but think that it is also wonderful to celebrate the changing of the seasons. Each comes with it’s own set of treats. For me, spring is asparagus and strawberries, summer brings fresh fruits and wonderful tomatoes, fall has pumpkins, hot cider and cranberries and winter has all of the holiday treats that are special to each of our families and regions. Stock up on pumpkins now to have for later, but also look forward to the coming taste treats.